For the past 3 weeks my husband and I have been on an experimental regimen. Oatmeal or smoothies for breakfast, regular lunch and lighter dinners, usually salad/soup/stir fry/baked fish and chicken. We decided to keep all the heavy-duty eating for the weekend, and stick to simpler stuff during the week. Ok I’ll stop trying to fluff it up, basically both of us realized we were spending too much time gorging in front of the TV and now we’re getting our act together, exercising regularly and eating better. I have been using lentils and beans as a base for salad and soup, and kidney beans are great for soup because of their velvety texture. I am a sucker for rajma-chawal, and sometimes I have rajma from a bowl, just like soup, with some grated cheese on top. But since the purpose was to eat kidney beans in a healthier fashion, I made a soup, pairing the beans with vegetables and less spice. This is one of those recipes I just made on the fly, combining whatever vegetables I had on hand and using very few spices- just cumin and paprika. Cumin for that nutty flavour and paprika for heat. 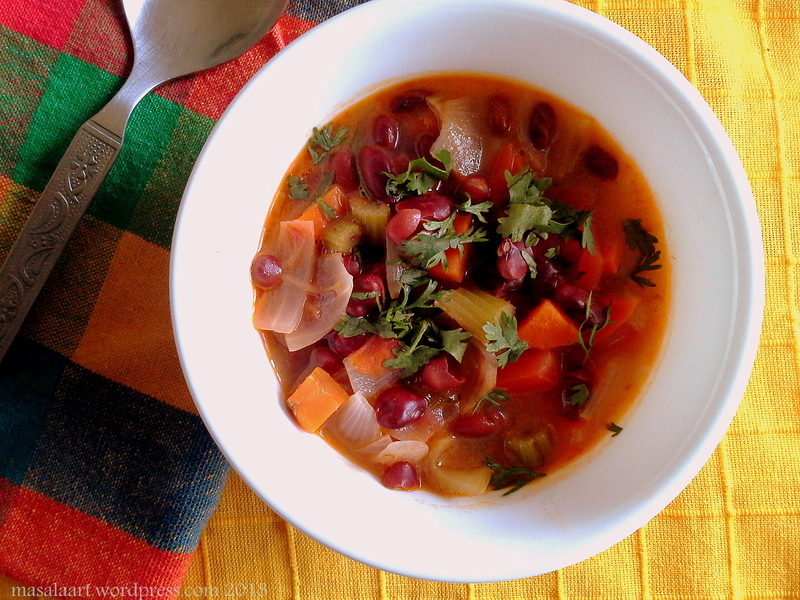 If you do some weekend prep and cook your kidney beans ahead, this is a simple meal you can get home and make after work on a weekday. Just throw everything in and let it simmer; by the time you unwind and freshen up it’s done! A little grated cheese on top = wonderful. Heat the oil in a large pot. When oil becomes hot, add the garlic and allow it to soften a little. Next, add the cumin and paprika powder and stir gently till the raw smell of the cumin powder disappears. Now add the diced veggies and sweat them out a little, 2-3 minutes, allowing them to release their aroma and soften. Add the kidney beans and stir fry for a minute or two. Add the stock, season with salt and pepper and turn the heat to medium-low; simmer for 20-25 minutes or until the vegetables are cooked through to your liking. How do you like preparing kidney beans? Since you mentioned smoothies for breakfast, here’s what i am obsessed with. It doesn’t taste healthy, in fact it looks and tastes a but sinful but it’s super filling and very nutritious. I know 🙂 How is Singapore? And peanuti butter + banana + chocolate is heaven. I am going to buy some peanut butter today and make this. Frozen bananas when blended have an ice creamy- texture! Thanks Kiran 🙂 I’m a way off from getting my food to look as gorgeous as yours, but it’s a start! Haha! Yup all good now. Oh and I am the Queen Of Late Response. I need to learn a thing or two from you about timely replies! This looks delicious and tasty! Lovely soup recipe. Great soup! Looks very filling. Thanks! It’s quite filling too- didn’t need bread on the side! I suppose one could add some mutton or beef mince and get a hearty chili like dish as well, ain’t so. I love this recipe. Will definitely try it out. Another way of eating kidney beans, right ? Thanks for sharing. This is a beautiful bowl of soup. I like that you used kidney beans instead of white beans or black beans. Nice twist. Thanks so much for dropping by and for the lovely comment! I like using kidney beans because they are easily available at my grocer; plus it’s great for curry too!